The first colorful piece for my white room is in place. I got the desk painted, and I must say I love this color! 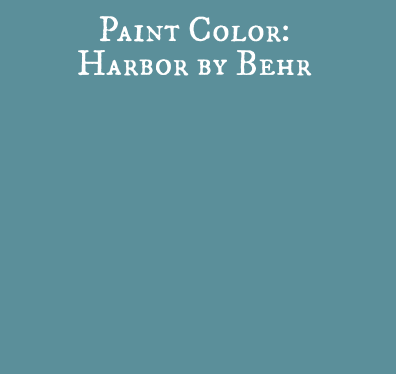 I painted it a turquoisey blue color called Harbor by Behr. 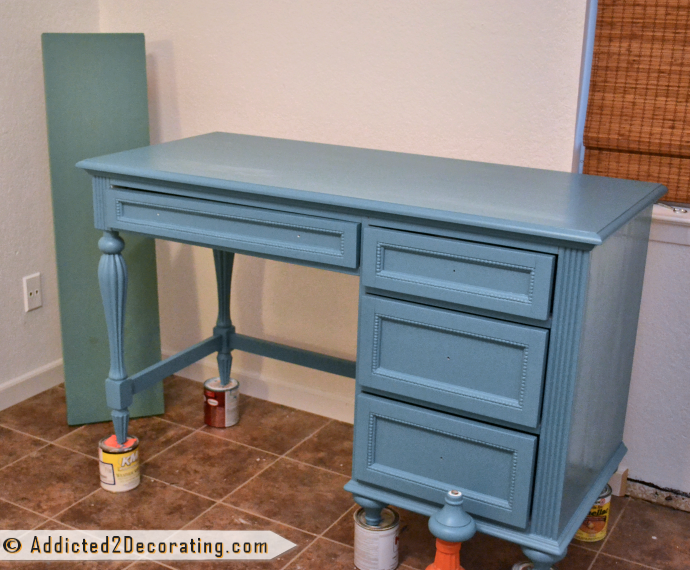 If you’ll remember from the picture last week, I had started painting the desk with Chalk Paint in the color called Barcelona. If you know me at all, you know that I love, love, love orange. But once the plan for this room started to come together in my head, the orange desk just really felt out of place. Orange might make an appearance in small bits here and there, but it won’t be on any major piece in the room. 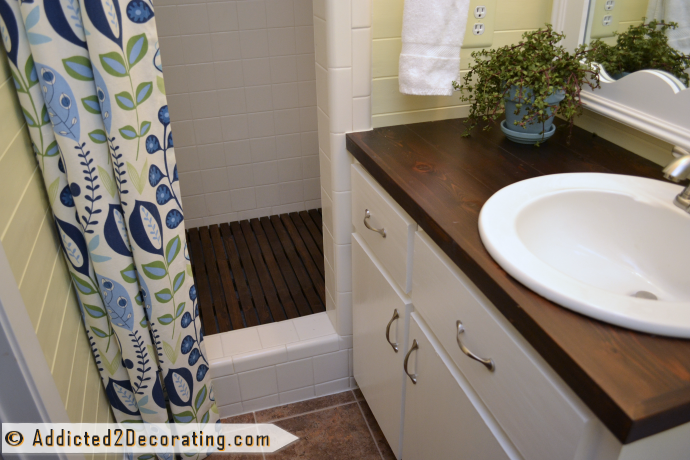 Instead, I’ll be taking my color cues from the fabric that I used as the shower curtain in the adjoining bathroom. I’ll be using blues, aquas, greens, and yellows for the most part. So the new desk color will blend nicely. When I chose the color, I thought it was going to be very similar to the color of the cabinets in my kitchen and breakfast room. But it’s actually quite a bit brighter and bluer than the Hallowed Hush that I used on the cabinets. I didn’t realize how much green my cabinet color had, but you can see the two colors here. The shelf is one that I had in the living room before I built the bookcase, and it’s painted with the kitchen cabinet color. 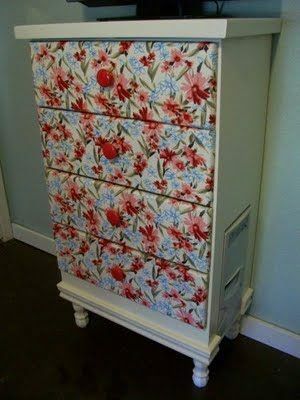 I didn’t want to use the original drawer pulls on the desk, and just as I was about to leave for Home Depot to pick up some new ones yesterday, I decided that I’d rather get some really cute ones from Hobby Lobby, which of course is closed on Sunday. 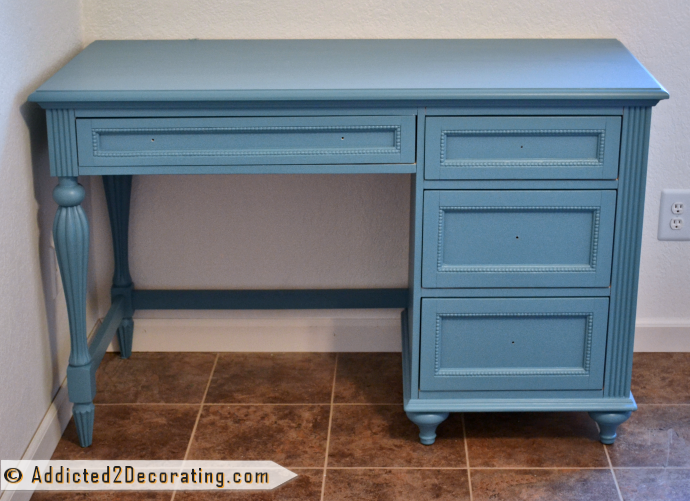 So I’ll head there today to see if they have some perfect little pulls for my new turquoisey blue desk. I know, I know. Chevron is sooooo 2011!! Oh well. It’s what I have, and I’d rather not spend more money on more fabric for a condo that we’re selling. So it’ll have to do. And honestly, I still really like it, and I think it’ll look fantastic in my white room. In addition to the desk, a lot more was accomplished this weekend. My mom and brother came over Friday and Saturday to help me get stuff done, and we worked hard!! The last flat hollow core door was replaced with a new six panel door, the closet was painted, closet door painted, the new door and trim was painted, the back of the bathroom door was painted, the window sill was cleaned, primed, sanded, and painted, the inside of cabinets were painted. I mean, we got sooo much done! But sadly, it’s the kind of stuff that makes for really boring blog posts. 😀 But even still, it feels good to see that much get done over two days, and I’m so thankful that they came to help me. Love that color and so glad to see the green fabric making an appearance again! Who cares that you bought it two years ago? It still looks great, especially with the blue and white. Long time follower, first time commenter. Kristi, that colour is gorgeous and I will definitely steal it for my night-stand makeover. 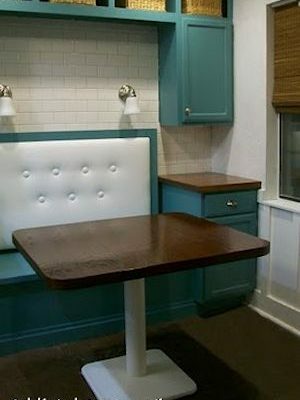 The kitchen cabinets look almost sage compared to it – still a lovely colour, just different. A giant thank-you for posting. 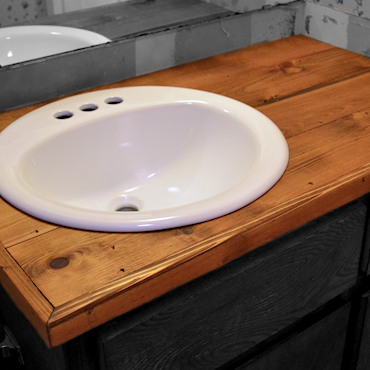 Knowing you can make your house beautiful and make any ugly piece or dated bathroom into exactly what you want is so empowering, and you use all my favourite colours (pardon the spelling, I’m Canadian). Loving it! What a busy weekend you had — so glad you were able to get some help! Any reason you chose Behr paint over chalk paint? I’m guessing it’s due to more color options. I have been following your blog for a while, and I just love what you do, and more importantly, how you do it! Your condo is coming together beautifully and the decor is awesome! Thanks so much for sharing and giving ideas. Lovely, lovely blue. Ah, I am looking forward to all the color that will have a home in this room! I know just what you mean about stuff that is boring but must be done. People will ask how much I’ve accomplished at my fixer upper and I’ll say a lot but not stuff you can actually see. . . That is wonderful that you have help from family on both sides Kristi. Many hands make light work (or whatever that saying is). I’m sure the condo will go in a flash when you list it. Desk is great, and the flow into the bathroom is going to work out perfectly. PLEASE make sure to give us a complete tour of the condo before you move out!! The desk looks great! 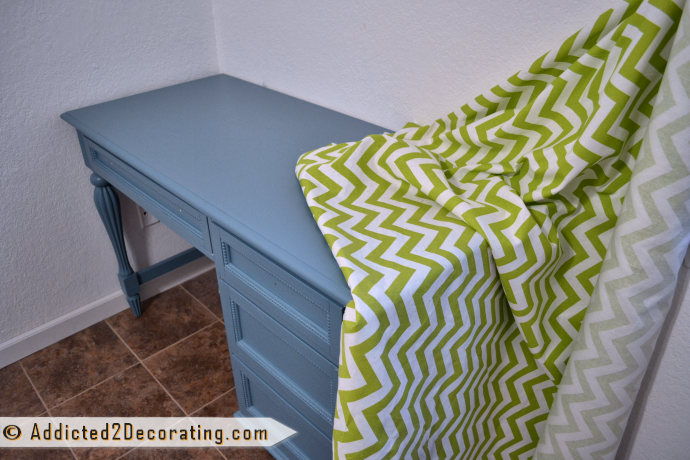 And I love the chevron fabric – 2011 or not. I am also extremely excited for a pinch pleated drape tutorial. I am obsessed with them but have yet to find any that aren’t mega bucks and also work with what I see in my mind. Thanks!! 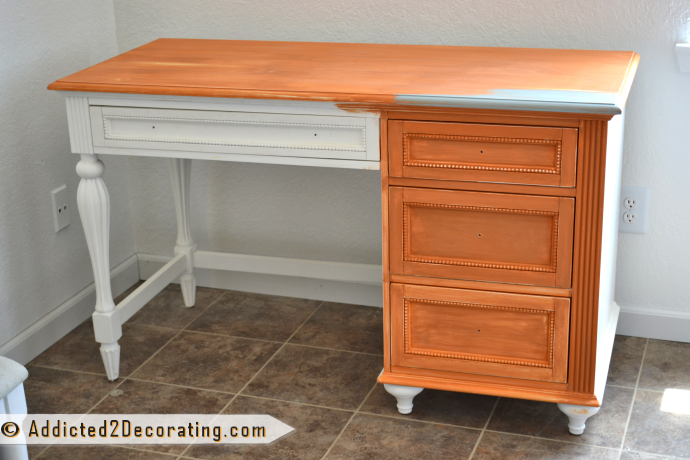 The desk looks great, Kristi- I love the color! I love that color of blue! It picks up the colors in the shower curtain perfectly! I really like that blue. It will look so fresh in the white room! Aaaaaah Kristi I just love your blog!! I hate to see the orange go, but I totally understand and white and blue together? Bam! It’s a great combo. Can’t wait to see the finished product and the video. Love the colour you chose for the desk. I like orange as well but the blue will make the two spaces work together. Looking forwards to seeing the room put together as well as the whole condo tour. 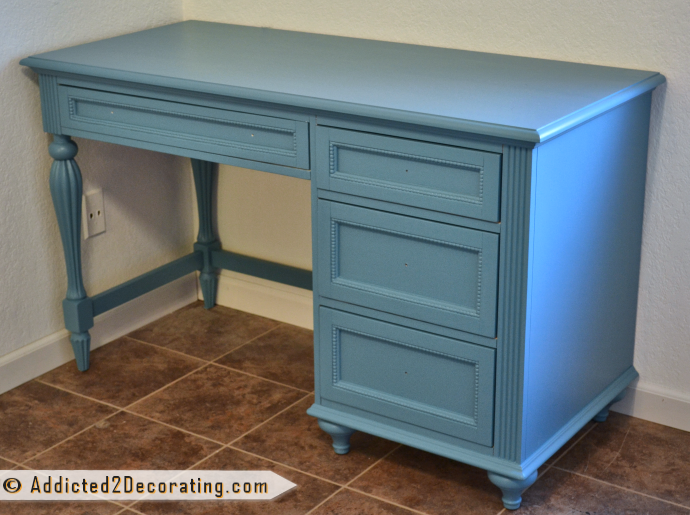 This is a gorgeous piece of painted furniture and it must look amazing against the white wall. You sure have an eye for what works, without spending a fortune! 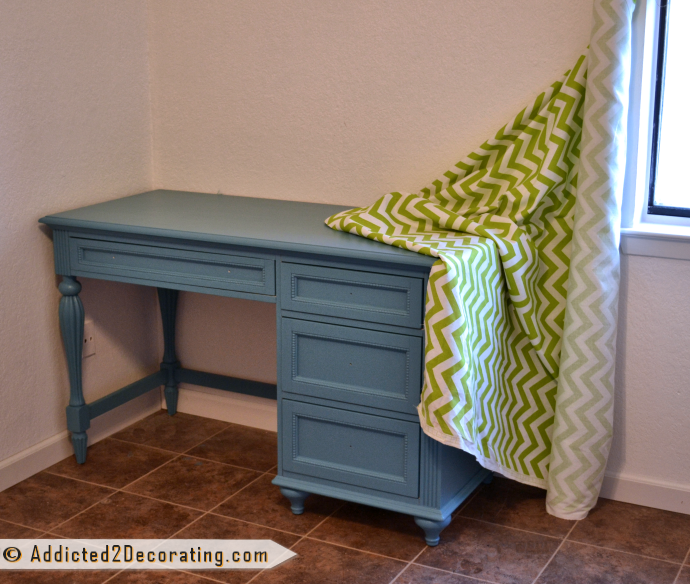 I LOVE that colour too… it looks amazing with that green chevron and the white walls. Can’t wait to see it all together!! I did buy some cute little orange knobs at Hobby Lobby. I’m not sure that I love them for the desk, but they’ll do for now. 🙂 I do love the assortment and selection of cute knobs at Hobby Lobby. I felt like I could have spent several hours looking through them and dreaming of uses for them!